Traditional gallery walks let students stroll through the classroom viewing their peers’ work, which is often set up on the top of their desks. At its heart, a gallery walk is an interactive, discussion technique where students move around the room, actively analyze information, and provide peers with feedback about their work (Fasse & Kolodner, 2000; Francek, 2006; Gooding & Metz, 2011). Similar to their namesake in the art world, a gallery walk can display any student learning artifact, ranging from visuals made on poster boards to research reports and 3D models. After the artifacts are displayed, students view, read, and analyze their peers’ work and offer feedback in the form of short notes or verbal comments. In the feedback, students document the information they learned from the artifact and offer ideas for improving it. Collaborative learning technologies (CLTs) that allow multiple students to access, develop, and edit the same document, presentation, or platform provide unique opportunities for feedback. As several students can manipulate these CLTs, they are able to add links, images, and audio recordings to them. Course instructors can utilize these CLTs by layering them together to create student-to-student interaction. For example, multiple students can simultaneously log onto the same Google Slides presentation and add to it in real time. Further, with researchers identifying quick, explicit feedback as being a key factor for student success when using technology (Gaytan & McEwen, 2007; Moore-Adams, Jones, & Cohen, 2016), the use of CLTs to digitalize the gallery walk strategy has positive implications for the online classroom and blended learning activities. By creating a gallery walk using CLTs, students can access their peers’ content and provide feedback and discussion in real time. As CLTs are rising in popularity and being blended into classroom instruction (Oreskovic, 2010), practitioners have the opportunity to layer these CLTs together. For example, instead of displaying artifacts on poster board, paper, or canvas, students in an online environment can first create a digital learning artifact such as an infographic, slideshow movie, or web flyer and then post a link to it using a CLT. In this manner, the CLTs become a platform for students to embed or link artifacts for virtual gallery walks. Example CLTs that can be used for these purposes in Padlet, Google Slides, and Dotstorming among several additional options. Students then partake in a virtual gallery walk by scrolling through the CLT and clicking the different content embed or linked to it. 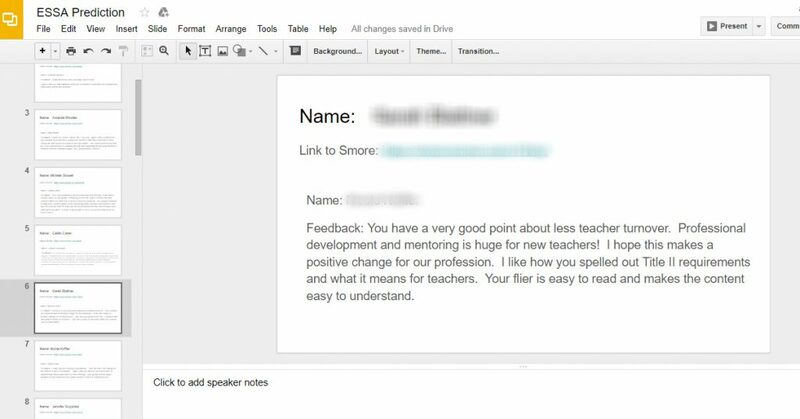 After viewing their peers’ work, students can offer their peers feedback either by typing it directly back into the CLTs as a new post, reply, or note or uploading feedback into a digital dropbox, such as Google Form. To make a gallery walk in an online class, the instructor first chooses the CLT that will house where the artifacts will be posted or linked (e.g., Google Slides, Padlet, Dotstorming, Real-Time Boards). The instructor then takes time to format how the students are to share their artifact, so there is a clear place for students to post their link and feedback. Artifact 1 shows a template for how this may look using Google Slides. When creating the space for students to share their work, it is crucial that a method for linking the artifact along with a place for providing feedback and the contributors’ names are included. Next, the instructor provides students access to the CLT and instructions for the gallery walk. Students then create their own artifact to be displayed as part of the gallery walk. To share it, students usually post a link to the artifact or embed it directly into the CLT, which layers the artifact into the CLT. Once students have posted their work, the instructor should ensure that all links are valid or that the artifacts are correctly embedded. Students are then instructed to write feedback to one or more of their peers either directly in the CLT or in the “Comments” section below it, and the feedback can include compliments, critiques, and suggestions for improvement. In the example previously described, the instructor was teaching a graduate-level course in education. The course enrolled 20 students who were licensed, in-service teachers, and the course was completely online. The instructor routinely introduced new technologies to the students to establish a culture where using new technologies was part of the learning process. To support their learning, he made a brief video overview of the technology to be used and his expectations for completing assignment along with a model assignment. 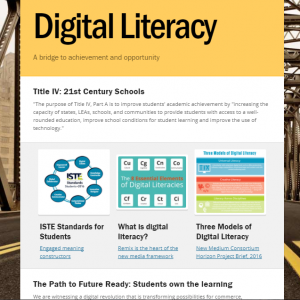 The digital gallery walk described here was implemented after students demonstrated competency for using new technologies. For this gallery walk, the students were asked to create an infographic using the Smore website about the implications for literacy education based on the Every Student Succeeds Act. As part of their infographic, students had to include text, images, and videos. After creating it, students shared their infographic by posting a link to it on the Google Slide. After all students posted their infographic and the instructor ensured that the links were valid, the students viewed their peers’ works and write feedback, as shown in Artifact 1. Artifact 1. A student’s artifact in the CLT template accompanied by student feedback. Fasse, B., and J.L. Kolodner (2000). Evaluating classroom practices using qualitative research methods: Defining and refining the process. In Fourth international conference of the learning sciences, eds. B. Fishman and S. O’Connor Divelbiss, 193–98. Mahwah, NJ: Lawrence Erlbaum. Francek, M. (2006). Promoting discussion in the science classroom using gallery walks. Journal of College Science Teaching, 36(1), 27-31. Gaytan, J., & McEwen, B. C. (2007). Effective online instructional and assessment strategies. The American Journal of Distance Education, 21(3), 117-132. Gooding, J., & Metz, B. (2011). After the lab: Learning begins when cleanup starts. Science Scope, 35(1), 29-33. Moore-Adams, B. L., Jones, W. M., & Cohen, J. (2016). Learning to teach online: A systematic review of the literature on K-12 teacher preparation for teaching online. Distance Education, 37(3), 333-348. Fegely, A.,Cherner, T. S. 2017. Digitalizing gallery walks: a method for student-centered feedback and engagement. In Chen, B., deNoyelles, A., & Thompson, K. (Eds. ), Teaching Online Pedagogical Repository. Orlando, FL: University of Central Florida Center for Distributed Learning. Retrieved April 26, 2019 from https://topr.online.ucf.edu/digitalizing-gallery-walks-method-student-centered-feedback-engagement/.